Diet soda is making headlines again. A new study reveals artificially sweetened drinks could lead to heart attacks, strokes, even an early death for older women. You may be surprised because it’s really not that many. (WXYZ) — Diet soda is making headlines again. A new study reveals artificially sweetened drinks could lead to heart attacks, strokes, even an early death for older women. You may be surprised because it’s really not that many. Now this major study was conducted by the American Heart Association and the American Stroke Association. It involved over 80,000 postmenopausal American women between the ages of 50 and 79. After following them for close to 12 years, here’s what the researchers found. 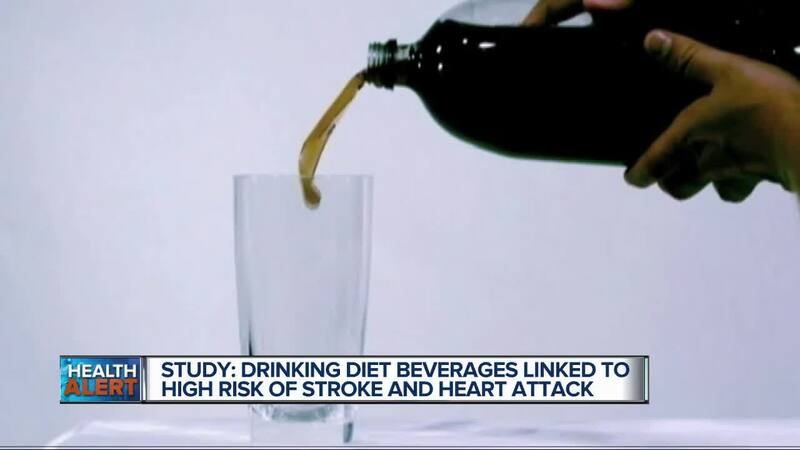 The women who drank two or more artificially sweetened beverages per day were 31% more likely to have a stroke caused by a blood clot, were 29% more likely to have heart disease, and were 16% more likely to die from any cause. The size of the drink in this study is a 12-fluid-ounce serving. And that’s your standard size soda can. As for the type of artificial sweetener, did the researchers find one in particular to be the culprit? No. Because this study is only observational. It only shows a link, not a cause and effect. So we can’t say diet beverages absolutely cause these health issues. But at the same time, you can’t brush off these findings either. The American Heart Association has said using artificially sweetened drinks for a short time could be “an effective strategy" when it comes to weight loss. But that’s only for adults, not kids. I know it can be hard for folks to switch from drinking sugary beverages to healthier options, so using diet drinks as a transition to water or herbal teas could be helpful. But if you’re drinking artificially sweetened drinks on a regular basis, I’d suggest you cut back or eliminate them until we know more about the long-term impact of these on people’s health.